L'Occitane has the most wonderful gifts at holiday times. One that I was able to try out was the Graceful Arlésienne Gift. This set is very nice and complements the fragrance wearer perfectly. Who is the Arlésienne woman? She is daring and gracious, the woman of Arles encompasses the beauty of Provence. Elusive and attractive, she leaves a fragrant trail bursting with color and life, that lingers wherever she goes. L'OCCITANE celebrates the beauty and refinement of this iconic woman with Arlésienne, their newest fragrance collection. It has a subtle bouquet of rose for her grace, sweet violet for her mystery and saffron for her temperament. Rose from Grasse, sweet violet and saffron from Provence come together in a floral fusion that reveals unexpected nuances. The Arlésienne fragrance evokes the woman of Arles, full of mystery, beauty and grace. This set will make great gift for any woman. The fragrance is not too heavy but has heart to it. It is not the lightest of scents. The violet in it is very nice. Adds some warmth for the rose. I like this fragrance a lot and do think that I will wear it a lot. I love L'Occitane scents. They are some of the best on the market today. Always thinking botanically what would be good together then doing that. I love that, I wish I could have that job. 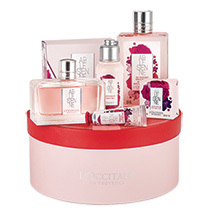 This set is $78.00 and is available online at usa.loccitane.com and in L'Occitane boutiques. Like L’Occitane on Facebook: https://www.facebook.com/loccitane.usa; Follow L’Occitane on Twitter: @LOCCITANE; Follow L’Occitane on Pinterest: http://www.pinterest.com/loccitane/; Subscribe to L’Occitane on YouTube: https://www.youtube.com/user/loccitaneenprovence/featured; Follow L’Occitane on Instagram: http://instagram.com/loccitane# and Follow L’Occitane on Google+: https://plus.google.com/+loccitaneusa/posts.